The 3 shots above were taken before I added a small embellishment, shown below. But they give a good idea of the color and fabric patterns. The bowl measures 10 1/4" long, 7 3/4" wide and is 4 1/8" high. I am sure I will be making more of these in different sizes. This yarn is a soft homespun in a variegated Seafoam green that is just yummy! Little by little I am finishing up projects and trying new techniques, in preparation for next year's shows. I hope to spend a little time in the next week or so, planning what I hope to tackle and accomplish in 2014, as well as reviewing what all I have done this year. That's what I hope to post about next. Meanwhile, I hope you all have a Happy Winter Solstice, Merry Christmas, Happy Boxing Day or Kwanzaa season, and a very Happy New Year! I am very pleased to have my Shabby Chic Scarves on sale there (see right side of picture) as well as some affordable gift items. 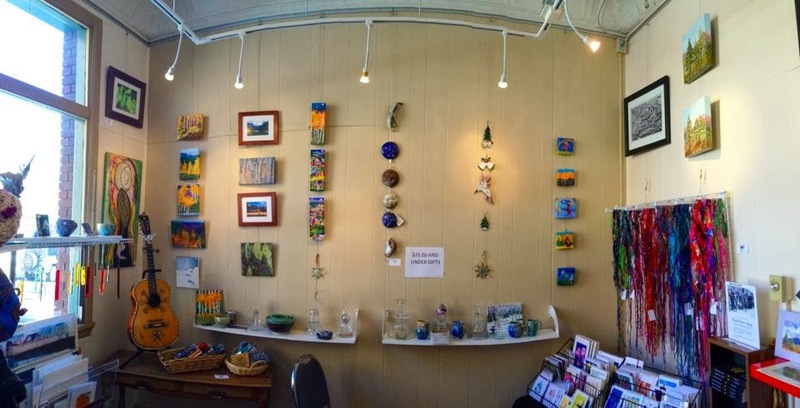 This is a fun gallery, and we have a very wide selection of many mediums available... if you happen to be in the Flagstaff area, I encourage you to stop by! The gallery is at 111 E Aspen Ave., just east of San Francisco St. north of Rte 66. Earlier, I went out and checked the thermometer on the front of the garage, and it was about 24 degrees at about 10:30am! Brrrr.... however, a quick check of the greenhouse thermometer showed a toasty 65... think I'll be spending a little more time out there to warm up! The one above has a trim along the top of beads... they don't show well in the photo, but they catch the light nicely. This one is wider at the bottom than I usually make them, with sides that are gently sloped. I curved the top row inward slightly to make it look more rounded. I am spending time right now learning some new techniques to make different shapes... hopefully I will find it easy to adapt, because I really want to expand my offerings in this area to include some new looks. I pressed them this morning and sorted into colorways, although most of the first batch I put together because they are hand dyed damasks. Deb uses a lot of these in her hand-stitched fiber art creations, and I have been intrigued by them for awhile now. I don't yet know what I will be doing with these gems, but I'm hoping to come up with a special project to use them on. I'll be sure to post results here, so keep a look out! Okay, back to work I go, Heigh-ho, heigh-ho! They're up! My brand new mini-boutique area is hung in the Artists' Coalition Gallery on Aspen in Flagstaff! I have been a busy bee, and finished 20 scarves for the display, just in time for First Friday Art Walk this Friday, Dec. 6th. I have some nice gift items available there as well, for under $25, as will a number of our members, so it's a great place to go for affordable holiday gift shopping!